I don't want first turn! ... Or do I? In principle, this sounds like a good idea. In practice, it kind of falls apart. 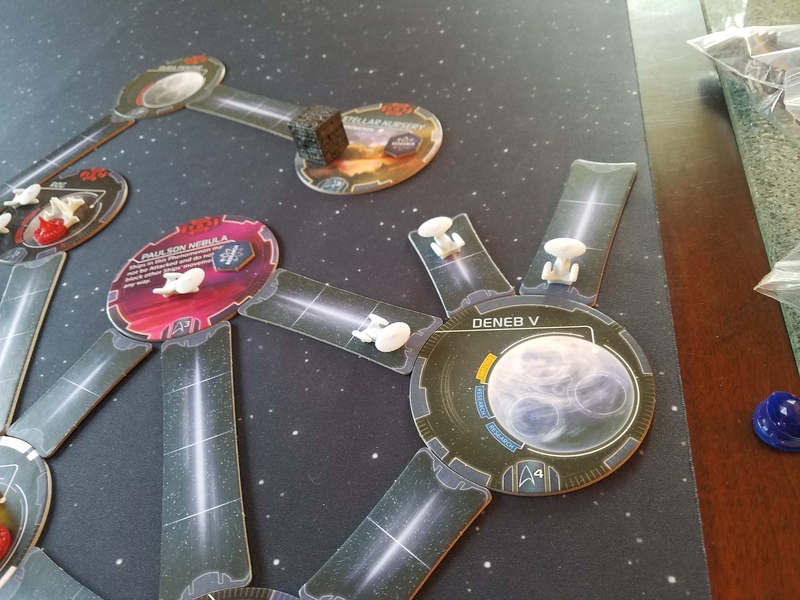 If no player's homeworld is connected to the Borg, then, by rule, the Borg are supposed to move in a straight line towards the first player's homeworld (that's "first player" in the current turn order). In principle, this is supposed to add a disincentive to always wanting to bid for the first turn. Maybe you want to bid for the second or third turn in order to force the Borg to target an opponent. 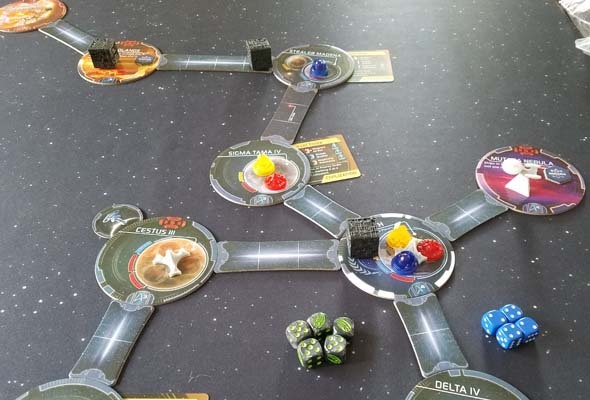 The problem is that if the Borg start the game in play, then turn order is random because nobody can bid on turn order until they've made first contact with at least one other player. 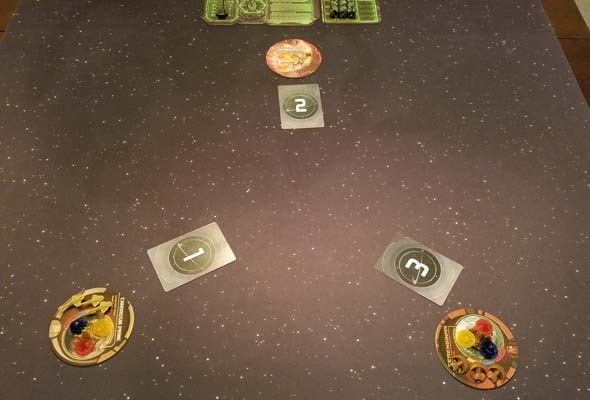 On the other hand, if the Borg do not start the game in play, but appear as the result of exploring a system, then, by default, the Borg are already connected to at least one player, so bidding for a higher turn order is moot because the Borg are already connected. Again, who becomes the early target of the Borg is determined randomly. If no other target is available, the Borg will move towards the first player in the turn order. If the Borg start in play (and therefore do not spawn in a position in which they are already connected to another player), then players take turns chosing which cubes to activate. So hypothetically, player 1 could chose to activate a cube that is more threatening towards another player, but that Cube will still prioritize targeting player 1 if there is no other players connected. If the Borg Cubes are connected to other players, then the fact that they almost always travel towards the nearest players' systems means that the order in which they are activated is usually moot. The only time this changes is if Borg ships would ever overlap. By rule, the Borg may never have more than 1 cube in any sector. If a Borg Cube would end its movement in a space occupied by another cube, the moving cube should stop before entering the occupied sector. Then, the other cube gets an extra activation! Even if it has already moved. 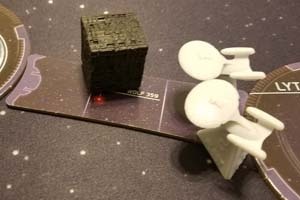 This rule can cause chain reactions in which multiple Borg cubes push each other along the board, and it can be devastating if it forces an unwanted early encounter with them. In this sense, the order of cube activation becomes relevant if the cube's movement is likely to cause it to move in the direction of another cube that is already on the board. Of course, you won't know if this will happen until after you chose which cube to activate and draw its Command Card. No sector may contain more than one Borg cube. If a cube lands in the same sector as another cube, the other cube gets an early/extra activation. The Borg start with a randomly-decided turn order? 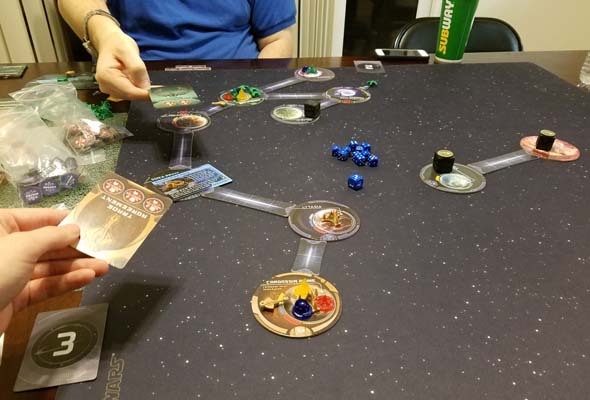 If the Borg do start the game in play, then they are assigned a random turn order card (by rule). This means that the Borg can (and often will) get a turn before one or more other players. 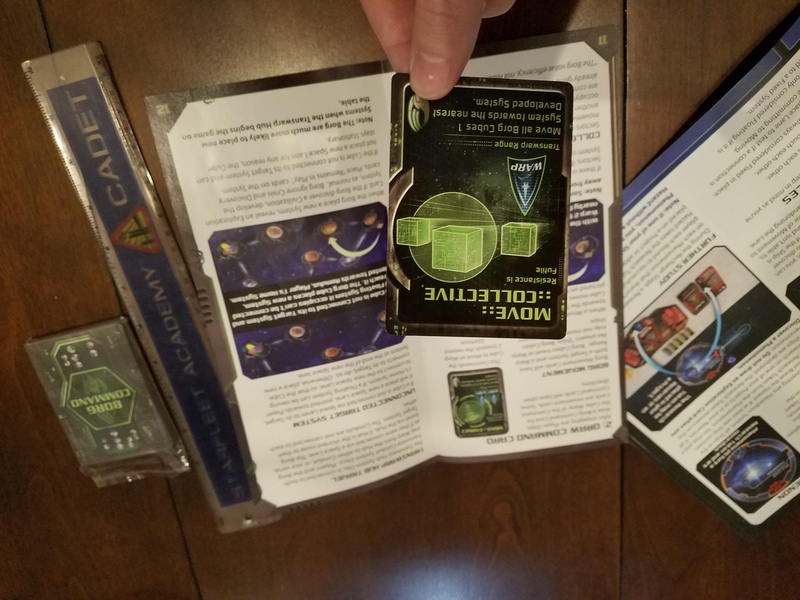 During set-up, you're supposed to stack the system and exploration decks with non-phenomena systems and non-Borg exploration cards equal to twice the number of players ("player" does not include the Borg). 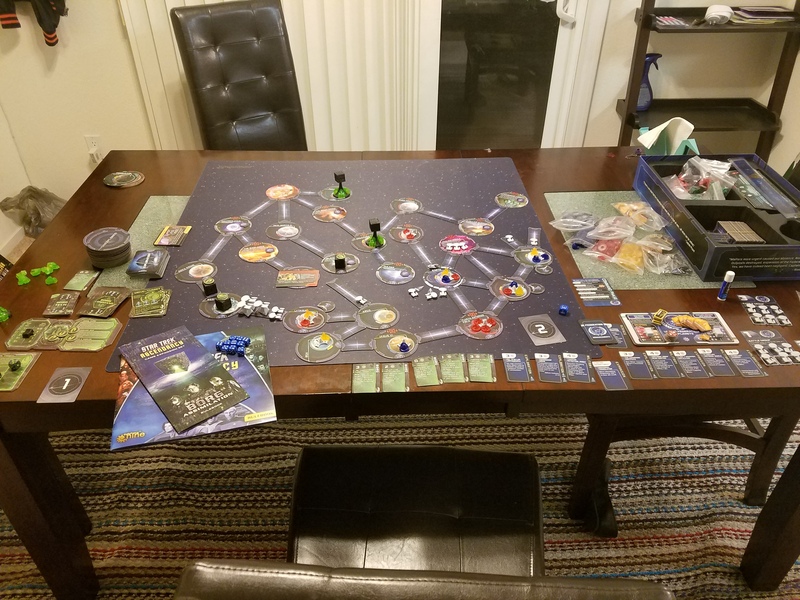 For a three-player game, this is six non-phenomena systems and six non-Borg exploration cards. 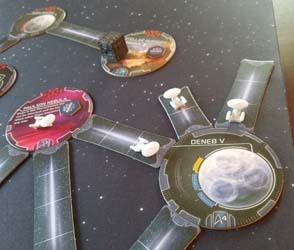 If the Borg take a turn before one or more other players, then the Borg will explore at least one of those system discs, and possibly at least one of the exploration cards. This leaves the last player in the turn order with that many fewer "safe" cards guaranteed. This means that the last player might draw a Transwarp Hub system disc or a Borg exploration card during his or her first or second exploration! 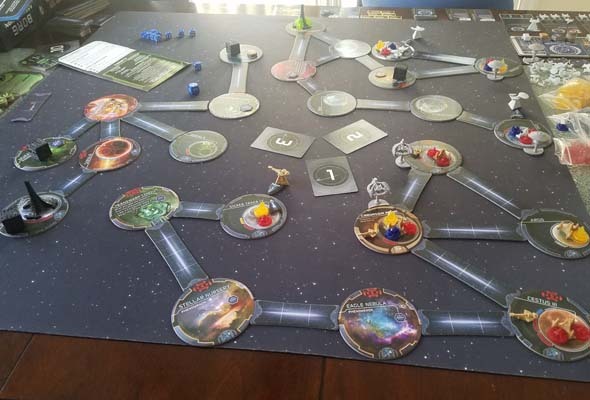 Since turn-bidding doesn't begin until players make connections between each other's home systems, it is impossible to prevent this with the rules as written. 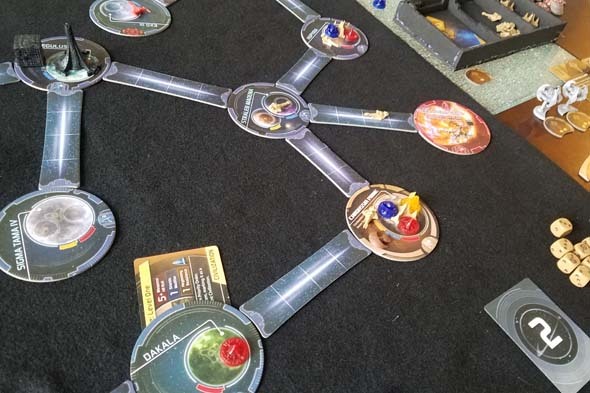 You'd have to house rule that either the Borg always go last in the first turn, or that you add two extra systems and exploration cards as if the Borg are a "player". 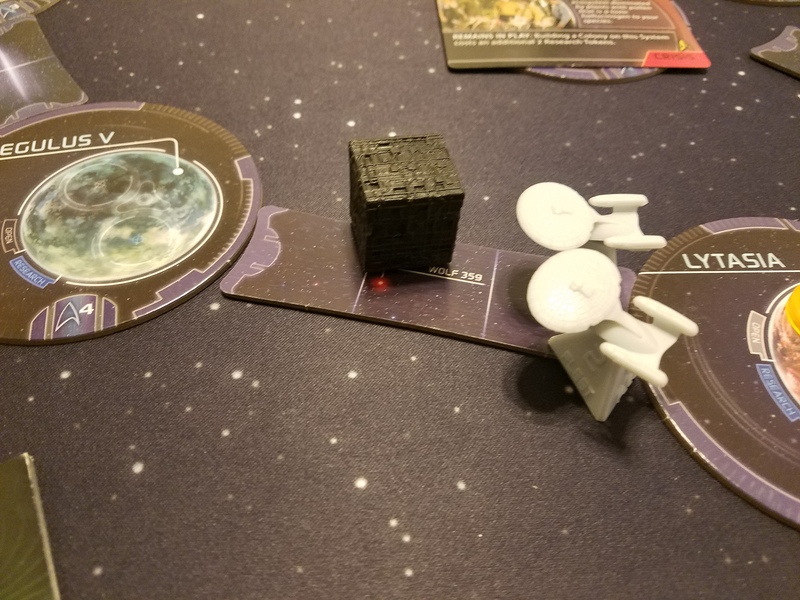 The Borg may move before other players on the first turn. "When you first set out from your Home System, you know you're not going to encounter the Borg or Phenomena immediately. While the Exploration cards you draw may be dangerous crises, you'll at least be able to Colonize the first two Systems you discover." Whoever wrote this seems to been completely unaware that the Borg may take a turn before all the other players have gone, and may explore one (or more) of those seeded worlds and/or exploration cards! Heck, whoever wrote the rules doesn't even seem to be aware that there's other rules that could screw players out of those first two "friendly" worlds. 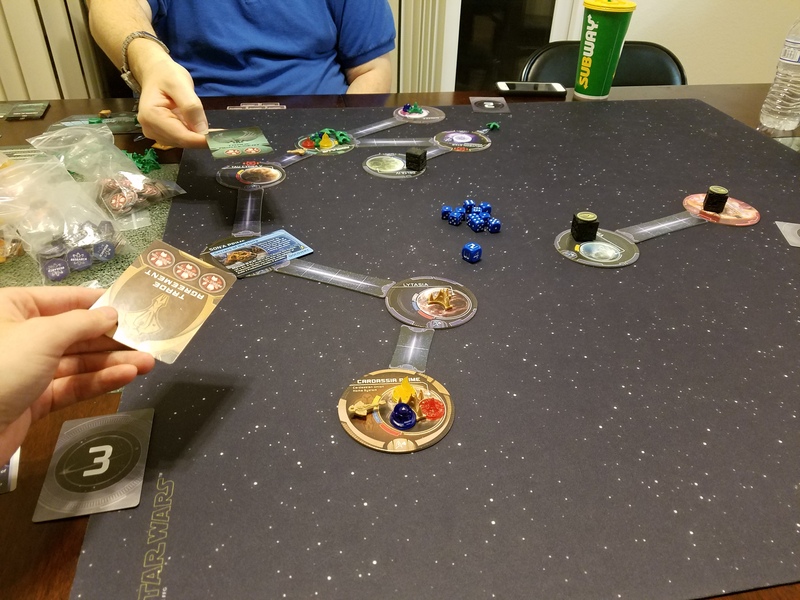 The Federation has advancements that allow them to look at two systems from the system deck, place one, and put the other at the bottom of the deck. That would screw any subsequent players in the turn order from being able to explore the discarded world(s). The Federation also have an advancement that allows an impulse move to go 3 sectors, which means they could potentially explore more than two systems if they use impulse moves and are lucky enough to draw distance-2 space lanes. Optional rules allow for the Federation to possibly start the game with one or both of these advancements in play. Even without starting with optional Advancements in play, there's still ways for the last player to get screwed out of those "safe" planets. 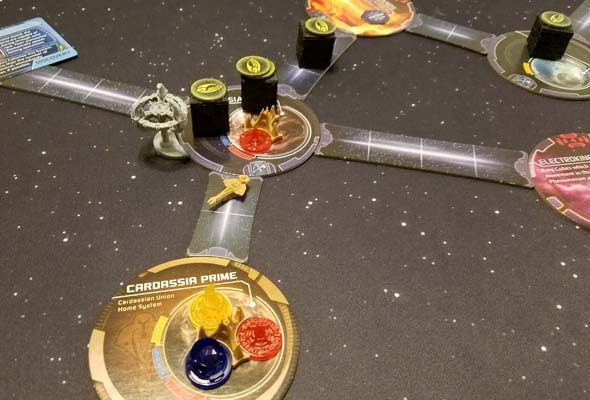 The Cardassian starting advancement grants them a sixth command token, which means (even without optional rules) they can explore a third system on the first turn. The Ferengi also have a fleet with the ability to enter warp without spending a command. 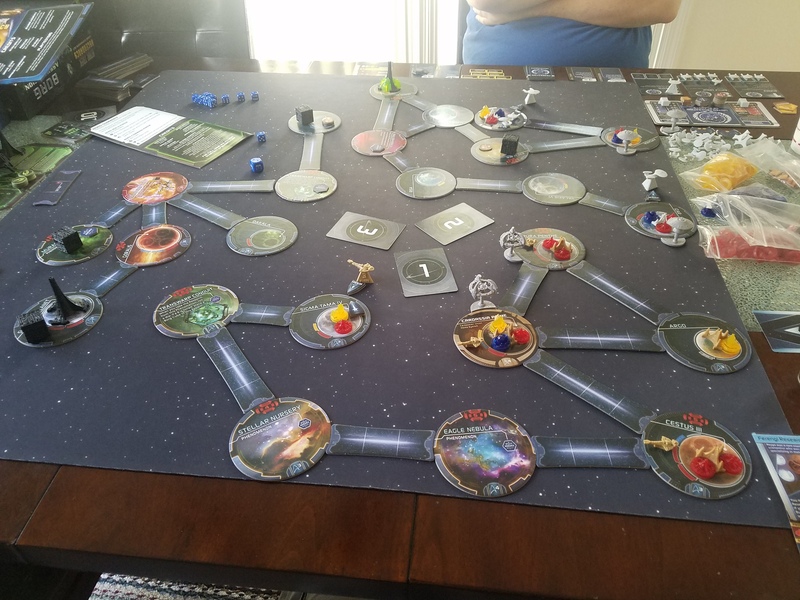 Commissioning that fleet on the first turn, the Ferengi player could hypotheticaly explore five systems on the first turn, burning through all the "safe" systems and exploration cards! and the Borg took a turn before the Ferengi and explored the last "friendly" sector. There's also always the chance that the Federation will discover a pre-warp civilization, and be unable to colonize, invade, or hegemonize the system. In this case, they'll have to explore further to find a system suitable for colonization or hegemony, and will risk running into the Borg before having an opportunity to control a second system. 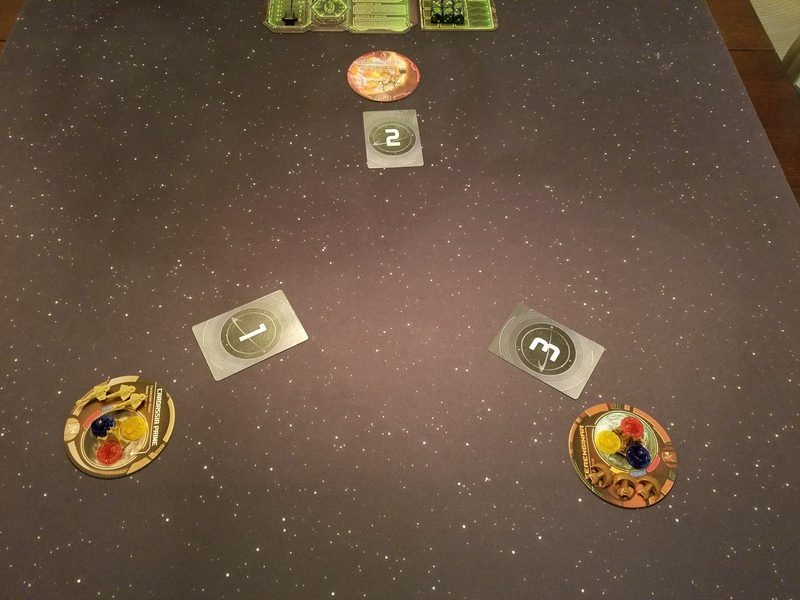 With the general Borg rules being as poorly thought-out as they are, the solo game is particularly un-fun to play. 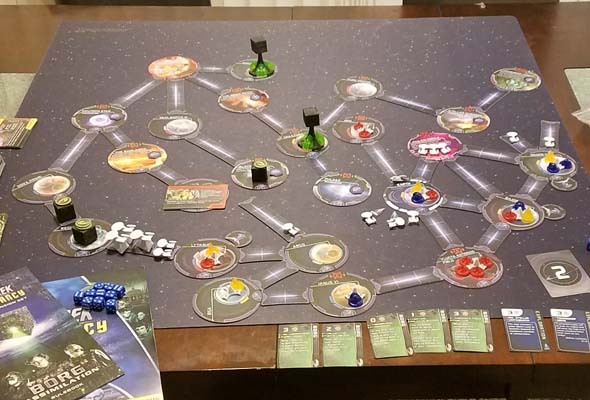 The Borg start in play and immediately start moving towards your homeworld with very little standing in their way. You also only get two "friendly" systems and exploration cards. All this combines to make the Borg feel especially unstoppable in a solo game. At least, that is unless you know how to manipulate the map in such a way so that you "rule lawyer" the Borg into being unable to actually get to you. In that case, you just turtle to a victory. This isn't particularly fun or rewarding either. Basically, if you can set up your initial exploration so that you cut your home system off so that the Borg can't create new space lanes into your systems, then they'll have to slowly try to find a long way around to you. If you max out the space lanes going into your homeworld and its neighboring systems (possibly by just camping a single starship in an unconnected space lane), then you can block the Borg and it becomes impossible for you to lose. ... until you figure out how to "rule lawyer" the map into preventing the Borg from reaching you. Since the Borg can never cram more than one cube into a single sector, you can also deliberately create a space lane connection to funnel them towards you. If you have your weapons and shields upgraded a couple times and put a full Battle Fleet or 2 to block the Borg coming through the funnel, then the Cubes are actually surprisingly easy to defeat due to the free first strike that you get against them. 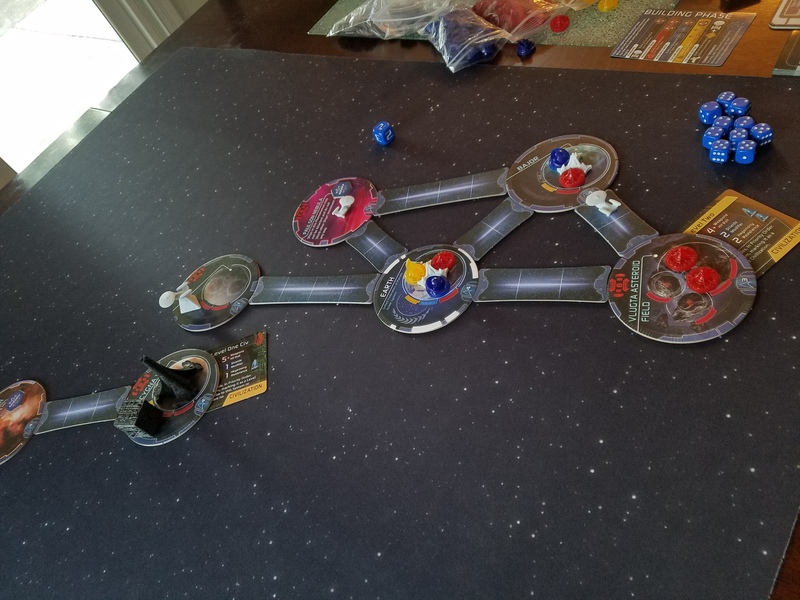 I spent an entire Saturday afternoon playing and replaying the solo game against the Borg. I got assimilated in short order during my first three attempts when trying to play the game in "good faith". When I utilized the exploits listed above (in the fourth game), I found that the Borg seemed trivial to deal with. I guess you could still get an unlucky exploration card that could spawn a Borg Cube at your doorstep, but that doesn't really feel like losing as much as it feels like the game being decided by a coin toss. Exploiting the game to beat the Borg just feels cheap and wasn't fun for me at all. Once weapons and shields are upgraded a couple times, you can funnel the Borg into a meat grinder. Playing with more players with the Transwarp Hub in play is more viable, but still doesn't feel particularly fair or balanced. At least in the two-player game, you still have another player to compete against and to divert the Borg's attention. But even so, in the best cases, the game still often comes down to a coin flip. 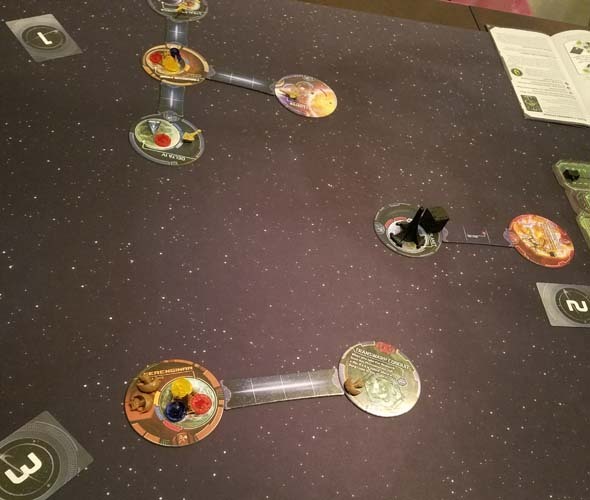 Whichever of the two players has the first space lane connection to the Borg Transwarp Hub basically has all the Borg forces funneling towards that one player, while the other player is free to farm five Ascendancy without any resistance from the Borg at all. 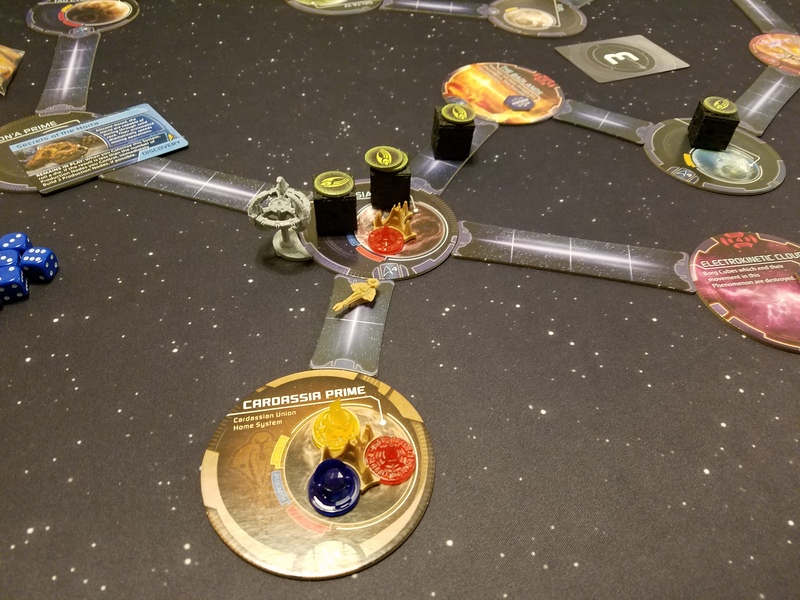 In the worst cases, the Borg spawn next to one player's homeworld, assimilate them a few turns into the game, and take two turns against the remaining player's one turn, and the game spirals downwards from there. 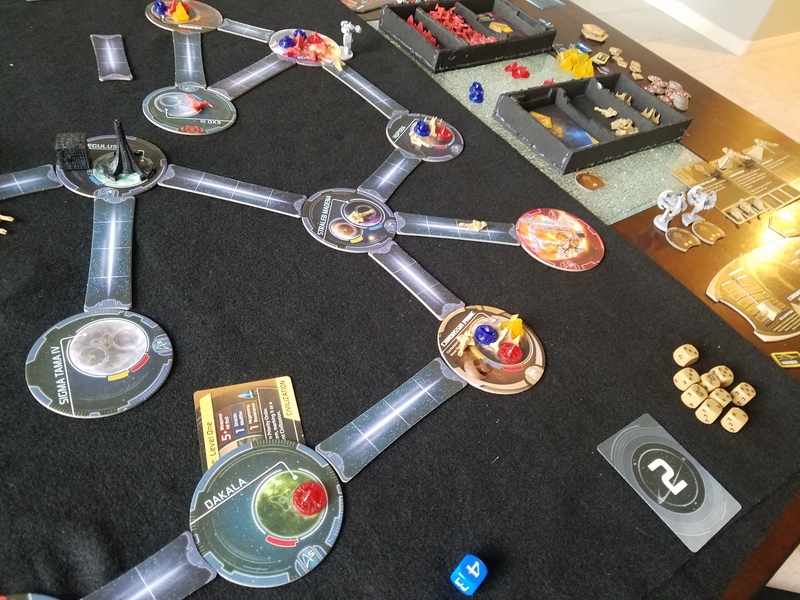 Put simply, the Borg expansion needs a lot of practice (and trial-and-error) to learn, and still often comes down to unfairly targeting a single player. Playing against the Transwarp Hub (with the Borg effectively acting as an extra NPC faction) just feels like a crap shoot that incentivizes exploitative and manipulative play. The Transwarp Hub has an "Unexplored" back, which means it can be shuffled into the system deck. I do not recommend doing so, as it will wildly unbalance the game! Add a sixth Spire that stays off the board and creates the Cubes that spawn in the Transwarp Hub (instead of the die roll). This Spire creates nodes and launches cubes using normal rules. When it launches a cube, it appears on the Transwarp Hub. All cards that cause Spires to create new nodes or launch Cubes would apply to this Spire. If the Borg would ever need to put this Spire (the sixth Spire) on the board, the Borg win. These rules, I feel would resolve my biggest complaints with the Borg. 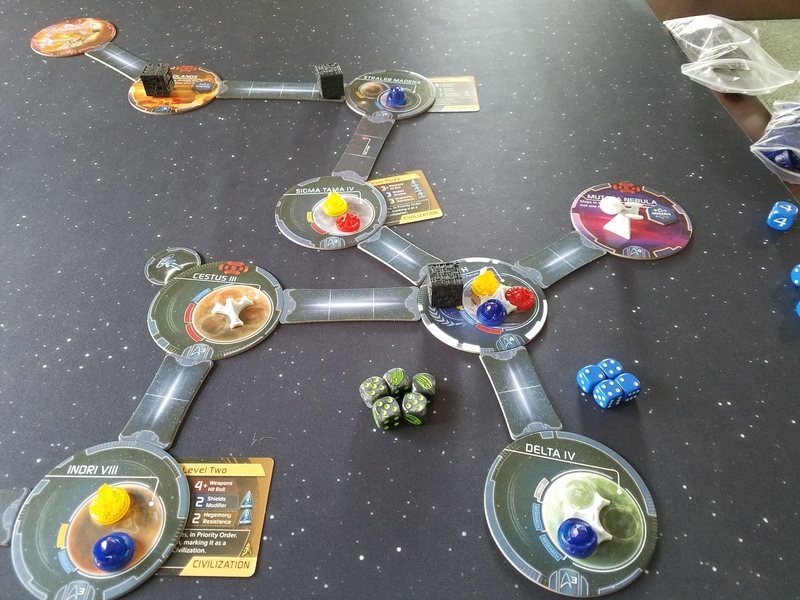 The "Explore" and "Target highest Ascendancy player" commands would cause the Borg to spread out more and not funnel all their Cubes along a single path after connecting to a single player. This would be especially true if the card allowed the Borg to create space lanes beyond a system's capacity. Targeting the highest Ascendancy player (or player with multiple homeworlds) would serve as a rubber-banding mechanic that would give the "winning" player more threats to deal with rather than piling onto the losing players. Alternatively, the Borg Assimilation expansion could have come with a ruler that could be used to measure distance to "unconnected" targets. There are a few cards that do not specify a "connected" target, and only say to move towards the nearest target. For example, one card says "Move all Borg Cubes one system towards the nearest developed system". This card does not specify "connected" developed system. Considering that every rule in the game that measures "distance" does so by counting sectors, and since the Borg expansion does not provide any additional rules for determining distance without counting sectors, I have to assume that this is a misprint, and the card is meant to say "nearest connected developed system". Some command cards do not specify "connected" target. Is this a misprint? How do you determine "nearest" if not by a count of space lanes? 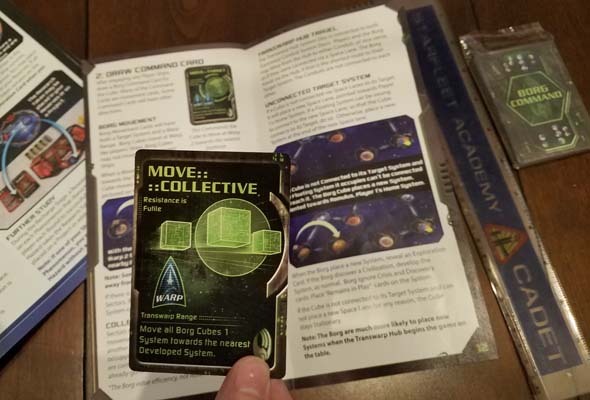 However, with a ruler that measures physical distance to unconnected systems, these cards would hypothetically allow the Borg to create new spacelanes and not funnel all the Cubes through a single connected path that will almost certainly disproportionately target a single player. 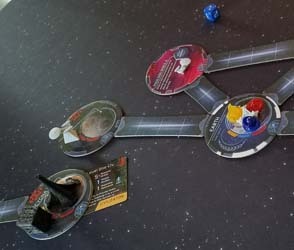 Making the solo and two-player variants viable would probably also require giving the Borg the ability to create new space lanes beyond a system's limit, which would prevent the player(s) from simply maxing out the connections on their first three worlds, making it impossible for the Borg to reach them, and then turtling to five ascendancy. Given that the Borg have advanced transwarp drives, them being able to violate certain movement or space lane-placement rules would make thematic sense. It's a shame that this expansion is as messy as it is. All the fundamental concepts are sound; it's just the execution that is messy. Having an NPC faction that plays against all players and provides some challenge from the board itself (as well as enabling the board to win against all players) is a sound concept. Having a powerful NPC threat to force cooperation between players is a brilliant idea! Having the Borg serve as a check and balance against runaway players is also a sound idea. Being able to continue playing if you're knocked out of the game is a great idea that allows defeated players to continue to participate and seek some revenge. The problems are all in the little minutia of the rules, which are either poorly thought-out, or poorly worded. Relegating the Borg to an optional threat that you might find from an exploration card seems like the best way to play them. Of course, it's then up to RNGesus whether they even show up in a given game or not, let alone whether they'll be a threat. Even if they do show up, they might be a completely incidental, one-off event that has little long-term impact on the game. If Gale Force 9 had sold a $15 Borg expansion that added some Borg Cube ships and some exploration cards that put them into play, along with some basic rules for moving the Cubes, then that would probably have been a perfectly suitable and serviceable expansion that would be worth the money. As it stands, without some massive clarifications or revisions from GF9, the Borg are just a confusing, unbalanced mess, and are generally more trouble than they're worth. Who knows, maybe that's the point? These are the Borg that Guinan warned us about. Being assimilated by the Borg does not knock you out of the game; you become a Borg player!